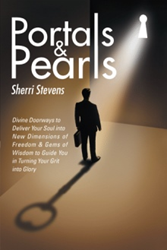 “Portals & Pearls: Divine Doorways to Deliver Your Soul into New Dimensions of Freedom & Gems of Wisdom to Guide You in Turning Your Grit into Glory” (published by WestBow Press) was produced out of Sherri Stevens’ frustration of how much of the instruction from the pulpit did not match up with the truth of the Scripture. The book is available for purchase at: https://www.amazon.com/Portals-Pearls-Doorways-Deliver-Dimensions/dp/1512794996. Stevens is embarking on a marketing campaign to expand her book’s reach. According to Stevens, “Portals and Pearls” was written to provoke readers to re-evaluate what they think “gospel truth” actually means. With devotional-designed chapters, the book is formatted and filled with bite-size ruminations to be engaging, entertaining and inspiring. With her own style, Stevens weaves God’s word into her adventurous personal experiences to empower lives with freedom and transformation. With “Portals & Pearls,” Stevens wants readers to think about what they have been taught and be inspired to dig into the Bible themselves. She wants them to come to a better understanding of the grace extended to them through Jesus Christ. Sherri Stevens is a world traveler, entrepreneur, fitness enthusiast and poet. She has also authored “Deep Calling Deep” and “Where Is God on My Bad Days?” She currently resides in Newport Beach with her family.